"You have no idea how hard he hit American culture." Oscilloscope Labs has released the official US trailer for a documentary titled The King, formerly known as Promised Land when it first premiered at last year's Cannes Film Festival. 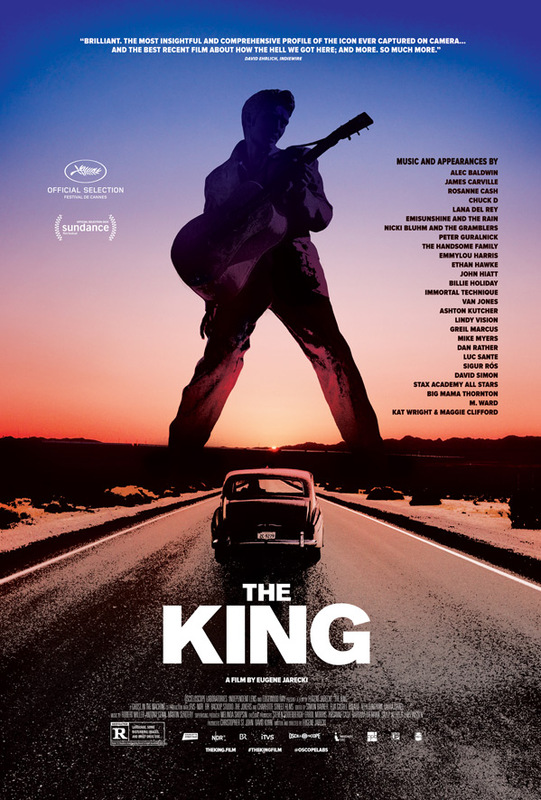 This doc is the latest made by Eugene Jarecki (The Trials of Henry Kissinger, Why We Fight, Reagan, The House I Live In) who delivers a deeply engaging, uber-intelligent, thoughtful documentary comparing Elvis Presley's rise & fall over his life to the rise & fall of America. It's a fascinating, thought-provoking, and considerably entertaining film framed around taking Elvis' 1963 Rolls Royce around the country to explore the places he frequented. I saw this film in Cannes last year and loved it, one of the most intriguing docs I've seen in a while, featuring so much intelligent discussion and discourse. A must see. Forty years after the death of Elvis Presley, two-time Sundance Grand Jury winner Eugene Jarecki’s new film takes the King’s 1963 Rolls-Royce on a musical road trip across America. From Memphis to New York, Las Vegas, and beyond, the journey traces the rise and fall of Elvis as a metaphor for the country he left behind. In this groundbreaking film, Jarecki paints a visionary portrait of the state of the American dream and a penetrating look at how the hell we got here. A diverse cast of Americans, both famous and not, join the journey, including Alec Baldwin, Rosanne Cash, Chuck D, Emmylou Harris, Ethan Hawke, Van Jones, Mike Myers, and Dan Rather, among many others. The King is directed by American filmmaker Eugene Jarecki, of the docs The Trials of Henry Kissinger, Why We Fight, Reagan, and The House I Live In previously. This first premiered at the Cannes Film Festival last year, and also played at the Deauville, Zurich, and Sundance Film Fests. Oscilloscope will release The King in select theaters starting June 22nd.